So I’ve been thinking a lot about digital comics lately. It all started with a paper I had to write for a Marketing class that finished up last week and was largely responisble for me not posting much lately. I was writing about Marvel’s failure to turn their success in cinemas into comics sales. It was admittedly a hatchet job. I had three pages to make my point and there was very little room for balance. Maybe I’ll post it here later this evening… But as I was finishing my paper and writing about the company’s distribution channels, the whole paper took a completely unexpected left turn into a discussion of digital comics. My main complaint was that yes Marvel has invested in digital comics with their Digital Comics Unlimited online service, but the fact that the books aren’t new or portable really handicaps it despite the reasonable price point. It’s possible that I’m just strange, but I have NO desire to be handcuffed to my computer when I want to read comics. It’s also why I don’t really take full advantage of the amazing but has-to-be-illegal HTML Comics site. I get that digital comics could on first glance potentially cannibalize sales of their print books but think about it this way. First, a large percentage of the people buying Marvel’s books are not like me at all and they view their books on some level as an invesment. They put the comics in bags with card boards backs and squirrel them away in special boxes. These types of people are not going to abandon Marvel’s pamphlets for digital comics. These people might be willing to purchase additional Marvel books that they don’t currently collect, however, if they had a low-cost way of doing so. Second, in the last sales figures I saw, the only Marvel book to sell over 100.000 copies was Captain America: Reborn. If the average Marvel movie makes $200 million, which is a conservative estimate since many make far more, and the average movie ticket price is $10, we’re talking about 20,000,000 people who are paying to see Marvel products on the screen. If Marvel could convince just one out of every 200 people who sees their films but doesn’t read comics to buy that Captain America title, sales would double. One out of 400 of those people picking up the title would result in a 50 percent rise in sales and that’s just their top book. What about all of the books that sell 50,000 copies? I don’t believe that reaching this audience is an impossible challenge, but I highly doubt most of those 400 people even know where a comicbook store is, let alone would they seek one out. And I know charging $4 for a 22 page book is not going to help matters at all. Wow, have I digressed. Digital comics. Right. The first comics technology I was exposed to for the phone was an Iverse produced prequel to the latest Star Trek film that was originally published by IDW Comics. IDW are mostly known for publishing licensed comic based on Angel, GI Joe, Transformers, 24 and now Star Trek, though their output is definitely more diverse than that. Not only was the story of that first digital book strong (and it addressed many of my complaints about the film), but the technology was impressive and the price point of $.99 an issue was impossible to ignore. I immediately saw the potential for comics in this new medium. No longer would you need to make a concerted effort to seek out a physical store that sold only comics to purchase obscure books. Suddenly, you could click your phone a few times and be reading a book seconds later. It’s kind of amazing to be honest. Both Iverse and Comixology have released strong iPhone apps. They both offer primarily indie comics at a price point of between $.99 and $1.99 per issue. The apps also both offer a large number of free comics to sample before committing to following the books either in print or digital form. Issues are usually broken down to be viewed panel by panel for an easy reading experience. This feature can, however, result in the reader not being able to appreciate the artist’s layout of the full page. Iverse compensates for this problem by offering the option of physically turning the iPhone from a landscape to portrait view, which shifts the image on screen from a single panel to the full page. It’s pretty slick. You move from panel-to-panel by swiping your finger across the screen. I was less impressed with Panelfly’s app which seemed to have simply have scanned the pages of the book I tried out. I needed to expand images to read the lettering and scroll around on the page with my finger to see it all. Not my favorite experience at all. The concept of digital comic books is relatively new to me and so far I’ve been mostly downloading free books to sample with several pleasant surprises. I’m really looking forward to exploring Elephantmen, Atomic Robo, and We Kill Monsters in more depth. Their sample issues were all very engaging and worth trying out. Several indie publishers including IDW have been very vocal about the fact that making their comics available digitally has both increased the sales of their physical books as well as provided an additional low-cost option for their products to potentially reach an audience that never goes into comicbook stores. Many indie publishers have largely been squeezed out of the Diamond Previews catalogue in recent years making it increasingly difficult for indie comics to reach the market at all. Some of these “books” are reportedly selling more copies online than in stores. While this is great for the publishers, I’ve long been of the opinion that digital comics won’t matter to most people who read comic books until one of these apps hooks up with Marvel and DC. Plenty of people likely disgree with that attitude. Marvel and DC, however, have to date seemed more worried about the danger of online piracy than the potential digital comics represent to expand their market. Today Marvel released a handful of comics for Iverse, Comixology and Panelfly. Strangely not only did Marvel not release the same books to all of the services, the price point varies with Panelfly offering their books at $.99 and the other companies offering their books at $1.99. The books released include the first Marvel Zombies mini-series, the first few years worth of the latest volume of Captain America and Astonishing X-men books, some Amazing Spider-man issues and more. I cannot stress enough how potentially game changing this could be for this industry, though I think Marvel needs to release way more books (including newer ones) to really move things forward. Hopefully that will come with time. I do hope Marvel pushes their price point down to $.99 as that seems to mostly be the digital standard. If I have to choose between spending $1.99 on 22 pages of a Marvel comic and an episode of Lost on iTunes. Marvel loses everytime. In addition, there’s the rumor that this mythic Apple Tablet product that might not even exist but might be released tomorrow or next year will come loaded with a comics app called Longbox. That’s one more game changer if you ask me. UPDATE: It’s been pointed out that I didn’t specifically state that DC Comics continues to have no real digital distribution in place for their comics. It’s really pretty sad how stuck in the past they are. You’ve seen this movie before. Over and over again. You know that movie where the kid finds that thing they really love but their parents won’t approve so they hide it from them and do the thing they love anyway even though it’s definitely going to end badly when their parents find out and someone inevitable gets arrested and then the kid runs away but something bad happens so they go home and the whole family makes nice with each other and the kid goes to do the thing they love again and the parents come along begrudgingly but in the end the parents are proud of the kid and in the middle there is some female bonding and almost a few laughs but not quite and the girl from death proof is in it but just a little. Yeah. 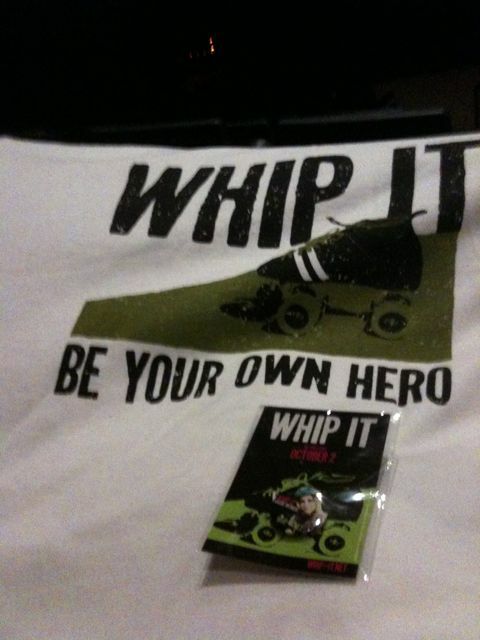 Whip It is like that sentence only longer. There’s some good music in it though. Oh and they gave me a free t-shirt when I went in… so that was nice I guess. Also there were real roller derby girls at the screening I was at and they were handing out flyers for a roller derby event at the 23rd Street Armory in Philly on Saturday. Doors open at 5 and it’s $25 at the door though there are some sort of VIP tickets available for $30. End of free plug.